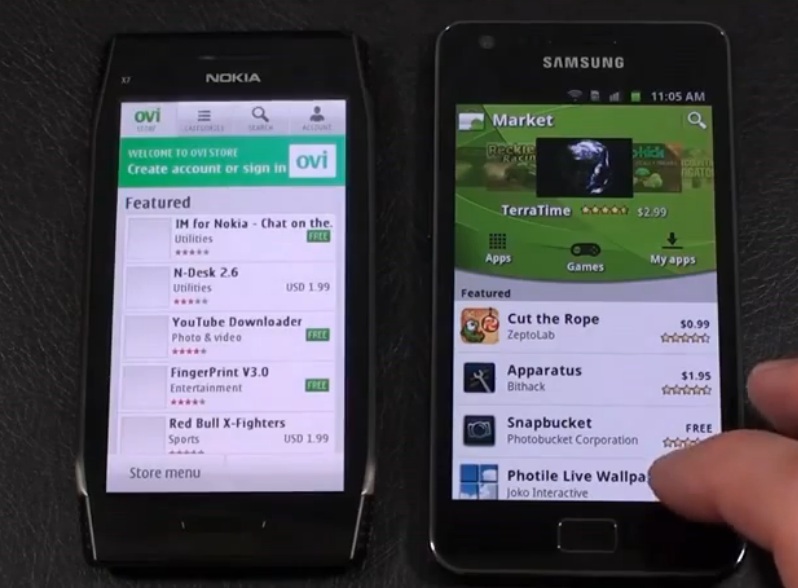 Smartphoneenvy has put up a couple of videos comparing the Nokia X7 against the Samsung Galaxy SII. The latter is Samsung’s flagship handset, arguably one of if not the best Android handset on the market. The X7, well no, that’s not Nokia’s flagship. It’s part of the ‘dilute all features, never amassing all strengths into one handset’ history. Considering what Nokia’s put inside the X7 compared to the SGSII (internally, the X7 is identical to the mid-low end Nokia C6-01! ), it doesn’t seem to fare all that badly. Asphalt 5 comparison is quite noticeable. Even on Gameloft’s official video, the game appeared to lag. The SGSII is really having none of that. On Amazon, both can be found at similar prices, though if some sellers list the X7 as ‘low’ as 379.99. The SGSII about 429. Sat Nav mode is interesting. Does Android do preloaded maps now? I can’t imagine zipping along the motorway and the phone having to download map data. It does look prettier somewhat with the satellite view on the SGSII (I find satellite view though a little distracting at times). Ultimately Ovi/Nokia maps has the nicest 3D but that’s limited to 20 cities and only not even available on phones. The 3D structures on Ovi Maps is ok, though limited, as is satellite view. Just as pure navigation, getting A to B, Ovi/Nokia Maps is great, and has gotten even better with 3.08. GPS signal strength, locking speed is important. If SGSII is anything like my Omnia 7 on that front, then it’s a bag of crap. Why does this X7’s Anna keyboard have no split screen? Does it do multitouch? I give up on the Symbian touch keyboard. Probably why I got along with E6 so much. Swype is a must install. Browser comparison is slightly less embarrassing. I remember how MicroB used to whip all other browsers in comparisons. Engadget test was slightly unfair as he pressed the SGSII bookmark but longpressed on the X7, and did not restart the test. But even on identical footing (as with first test) the SGSII would have won anyway. It PAINS me to see the slight lags in scrolling 🙁 And the delay with chequer-boarding when zooming out. IMO Anna is good, it gets things done. I don’t think it’s as ‘pretty’ as Android though which is why the general response of the public is that it’s nicer and Symbian is old and dated. I think Anna Icons are nicer than Samsung’s. The default browser really does pale in comparison to SGSII. Some other comparisons – camera UI, Music Player, video player, Email would have been cool. « TwimGo Twitter client for N900, S^3 and S60v5 updated.